Next year will mark 50 years that the Chappellet family has been producing wines on Pritchard Hill in Napa Valley. These days, the second generation has joined the efforts at Chappellet. Their work involves a firm belief in sustainable practices, which they have become vanguards of in Napa Valley. A mere 16% of their 640 acre estate is under vine. The areas that are planted have been certified organic since 2012. Phillip Corallo-Titus joined Chappellet as assistant winemaker in 1981. In 1990, he took over the reins as head winemaker and has been driving the winemaking team ever since. While their portfolio includes Napa Valley standard bearers such as Cabernet Sauvignon and Chardonnay, they also feature Chenin Blanc, Cabernet Franc, Zinfandel, Malbec and more. In short, it’s a diverse offering loaded with wines produced from their Estate, as well as select vineyards that meet their standards. Here’s a look at four current standout releases. This wine is comprised entirely of Chenin Blanc from Estate Vineyards on Pritchard Hill, which were replanted in 2004. Fermentation took place in stainless steel, neutral French oak and concrete egg. 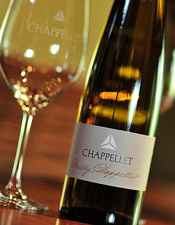 Not many producers in Napa Valley make a Chenin Blanc, and even fewer do it well, but this offering from Chappellet hits all the right notes for me. This starts with the lovely and somewhat boisterous nose, which features lychee fruit, apricot and bits of citrus zest. Additionally, the even-keeled palate is loaded with stone fruits, minerals and a dollop of spices. All of these characteristics come together on the clean, crisp finish, which has good length and depth. The fruit for this Chardonnay was sourced in a handful of diverse areas in Napa Valley, the common thread being that they are all cool-growing regions, which is ideal for Chardonnay. It sat on the lees for eight months and was aged in one third new French oak. From the first whiff to the last sip, this remarkably delicious Chardonnay is simply loaded with a ton of pure and delicious fruit flavors. Orchard fruit and lemon curd aromas leap from the nose. The deeply layered palate is filled with apple, pear, bits of mango, toasty oak and more. Vanilla bean, crème fraiche and continuing pure fruit flavors are all evident on the long, lush finish. Martin Ray Winery’s history dates back to the 1940s in the Santa Cruz Mountains. Their second life started in 1990 when Courtney Benham bought the winery and moved it to the Russian River Valley. While they’re now deeply ensconced in Sonoma County, Martin Ray Winery continues to produce wines from the Santa Cruz Mountains too. Both of these areas are well suited for a variety of grapes to thrive. Chardonnay and Pinot Noir are among those that do the best. I recently tasted a number of selections from them. Here are four that I really enjoyed and highly recommend. This is entirely Chardonnay from a single vineyard located on Dutton Ranch in The Russian River Valley. Aging took place over 12 months in 40% new French oak. After aging, select barrels are chosen for the final blend. The spice-driven nose also features a bevy of other attractive aromas such as subtle toast, crème fraiche and yellow apple. Lemon curd, Anjou pear and more are on display throughout the layered and complex palate. Continued spices, hints of lemon merengue pie crust and more emerge on the long luscious finish. All of the fruit for this wine (entirely Chardonnay) was sourced at the namesake vineyard in the Santa Cruz Mountains. Barrel aging took place over a year in 40% New French oak. Pineapple and spice aromas dominate the lovely nose. Asian pear, citrus zest and hints of stone fruit are all apparent on the engaging palate. Wet limestone and gentle hints of brown sugar appear on the above average finish.